There are thousands of types of collectible clocks available whether you choose to stick with antique styles or unique clocks from the Atomic Age. The most difficult part of collecting may be narrowing down your choices. People collect clocks for their beauty, historical and scientific value. Clocks can be exact scientific instruments as well as beautiful antique objects like jewelry and vases. Whatever the reason that you collect them, the loud ticking of an antique clock evokes nostalgia among many collectors. Categorizing clocks into groups can be difficult because of the various names given to them. Savage and Polite's Antique Clock Price Guide has 44 categories of clocks represented. You can see images of each style of clock on their site. Collectible clocks can be broken down even more by adding subcategories. The following list of collectible and antique clocks is a list of the most popular clocks to collect, but there are other types and styles too. Advertising clocks were created by manufacturers to give to customers as an incentive. They usually have the advertiser's logo on the face or elsewhere on the clocks and may have other decorations as well. These were usually wall clocks or shelf clocks. These have become quite popular and the collector should beware of fakes. Looking at many authentic clocks will give you a feel for what it should look like, making it easier to spot a fake. Vintage Westclox has an excellent article with images on real and fake advertising clocks. Beehive clocks are a shelf clock that has a case with curved sides. The sides meet at a peak in the center of the top, creating a beehive or church window shape. Popular from the 1840s to the early part of the 20th century, these clocks have a look similar to the Gothic architecture that was popular at the same time. Antiques Roadshow has a beautiful example of a Mahogany veneer beehive clock from the early 1800s. One of the most well known Blinker clocks is the Felix the Cat Blinker that was popular in the early part of the 1900s. The eyes moved in time to the pendulum which looked like the cat's tail. Sometimes only the eyes moved depending on the character.While cats were a popular theme for this type of clock, there were other figures as well. Fake blinker clocks are often made in China; many are of poor quality. Cuckoo clocks were invented in 1730 in Germany but didn't become popular until the last 25 years of the Victorian era. These weight-driven clocks are most commonly seen as wall clocks, although there are a few that were made as spring driven shelf clocks. A small cuckoo bird or other figure is housed in the case and emerges from a door, or doors, at the top to announce the hour and half hour. Figural clocks feature a statue of a person or an animal as part of the design. 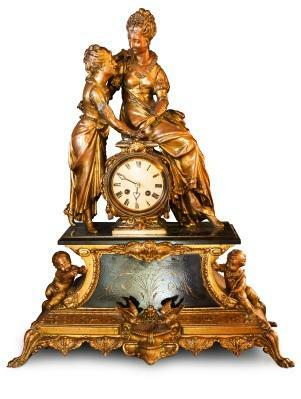 The Ansonia Clock Company was the primary manufacturer of figural clocks. These gorgeous creations were found in wealthy Victorian homes. This was a purely American clock that was produced in mass quantities in the last part of the 1800s and was found in the kitchens of lower and middle class homes. The oak or walnut cases were press-molded and were highly decorated. All the major clockmakers made this type of clock. Oak clocks can be found for $100 dollars and up while the walnut variety may go for considerably more. This type is rarely reproduced; most gingerbread clocks are authentic. Tall case clocks may also be called long case clocks. This category includes grandfather and grandmother clocks. These are clocks that stand on the floor and have weight driven movements contained in the upper part of the clock, also called the hood. The tall case allowed the weights to drop the correct distance to keep proper time and protected them. These were first made in the 1600s. Collector's Weekly reports that the clocks fell out of favor in the late 1800s. As ceiling styles got lower, sometimes the clocks were cut down or the decoration on the top was removed. Clock faces were painted or changed to give an updated appearance to the clock. These changes can take the value of a clock from $100,000.00 down to $10,000.00 or less. Tall case clocks are expensive when authentic and in good condition. Be wary of a grandfather clock that seems to be under priced. It is important to buy clocks from well respected antique dealers and stores. Make sure that you know and understand the seller's return policies and guarantees. It is best to buy your clock locally if at all possible. Since that is not always possible there are a few venues on the Internet where you can purchase from reputable sellers. Skips Clock Shop is a shop in Vermont that has been recommended by Yankee Magazine. They sell and repair clocks locally as well as from the Internet. Delany Antique Clocks is located north of Boston, Massachusetts. They specialize in tall case clocks. Old Timers Antique Clocks is located in Pennsylvania. They are members of the National Association of Watch and Clock Collectors. Some people collect clocks by category; they may have an entire collection of advertising clocks, for example. Others prefer to collect clocks by certain manufacturers or by certain categories, like the Blinker clocks. Like any other collectible it is important to choose those items that you love and display them with pride, no matter how large your collection is.